A team of scientists developed Internet Atlas, the first detailed map of the internet’s structure worldwide. 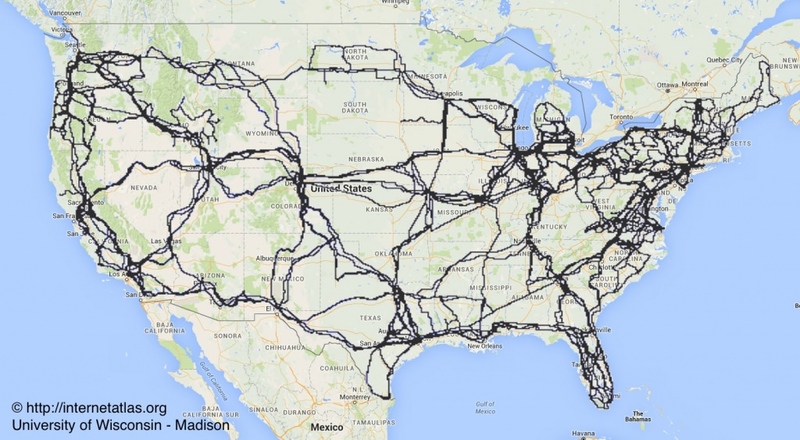 The lines represent crucial pieces of the physical infrastructure of the internet that billions of people rely on. Despite the internet-dependent nature of our world, a thorough understanding of the internet’s physical makeup has only recently emerged, thanks to painstaking work by University of Wisconsin–Madison researchers and their collaborators. Professor of Computer Sciences Paul Barford, Ph.D. candidate Ramakrishnan (Ram) Durairajan and colleagues have developed Internet Atlas, the first detailed map of the internet’s structure worldwide. While average users rarely think of these elements, things like submarine cables — buried below the ocean floor — run between continents to enable communication. Data centers in buildings all over the world are packed with servers storing many types of data. Traffic exchange occurs between different service providers at internet exchange points. Though these and other elements may be out of sight for the average user, they are crucial pieces of the physical infrastructure that billions of people rely on. Collaborators on the team include Joel Sommers, a UW–Madison alumnus now on the faculty at Colgate University; Walter Willinger, chief scientist at the NIKSUN Innovation Center; and graduate and undergraduate research assistants who help with data collection. Supported by a Department of Homeland Security grant, Internet Atlas has already attracted considerable attention from publications like MIT Technology Review, New Scientist and others. And in February, Barford and Durairajan presented their work at the RSA Conference in San Francisco, the world’s biggest information security conference. Internet Atlas was one of a select group of DHS-funded projects invited to present at the conference. “It was nice recognition” to be chosen, says Barford, since RSA is attended by tens of thousands. Mapping the physical internet helps stakeholders boost performance and guard against a number of threats, from terrorism to extreme weather events like hurricanes. Furthermore, “a lot of infrastructure is by major right-of-ways, like railroad lines,” says Barford, meaning that an event like a train derailment could end up disrupting internet communications. “The question of ‘how does mapping contribute to security?’ is one of our fundamental concerns,” says Durairajan. Though these and other elements may be out of sight for the average user, they are crucial pieces of the physical infrastructure of the internet that billions of people rely on. The project has helped direct attention to the problem of shared risk, the subject of an influential 2015 paper by the team. Physical infrastructure is commonly shared by multiple networking entities, so damage to any particular piece of infrastructure can impact more than one entity. “We quantified that for the first time,” says Barford. Much of the data used to create the Internet Atlas comes from publicly available information, such as what internet service providers publish on their websites. Other data has taken more legwork to uncover, such as combing through mundane items like local permits for laying cables. “The core work is grunt work, but by rolling up our sleeves, we assembled a unique data set,” says Barford. Now, the team is looking to enhance the maps even further and share their work so it can be deployed by others to boost network performance and security.